Mature dendritic cells (DCs) have the capacity to induce efficient primary T cell response and effector cell differentiation. Thus, these cells are a major tool in the design of various immunotherapeutic protocols. We have tested the capacity of different subsets of matured DCs pulsed with a peptide to induce the differentiation of naive CD8 T cells into memory cells in vivo. Flt3 ligand (FL) induces the differentiation of conventional DCs (cDCs) and plasmacytoid DCs (PDCs) from murine bone marrow precursors in vitro. After maturation, both subsets become strong stimulators of Ag-specific T cell responses in vitro. However, the in vivo T cell stimulatory capacity of these DC subsets has not been studied in detail. In the present study, we demonstrate that mature FL-generated DCs induce efficient peptide-specific CD8 T cell response and memory cell differentiation in vivo. This is mainly due to the cDC subset because the PDC subset induced only a negligible primary CD8 response without detectable levels of memory CD8 T cell differentiation. Thus, in vitro FL-generated mature cDCs, but not PDCs, are potent stimulators of peptide-specific CD8 T cell responses and memory generation in vivo. Dendritic cells (DCs)3 play an important role in the primary T cell responses and the generation of effector cells in vivo (1). It has been demonstrated that DCs are heterogeneous and are constituted of different subpopulations of cells that differ in their origin, phenotype, localization, and function (reviewed in Ref. 2). The recently identified murine plasmacytoid DCs (PDCs) produce high levels of IFN type I in response to different pathogen-derived stimuli. They can also be distinguished from conventional DCs (cDCs) by their surface phenotype (3, 4, 5, 6, 7). Indeed, murine PDCs express B220 and low levels of CD11c but are CD11b−, whereas cDCs express high levels of CD11c and CD11b but do not express B220 (3, 4, 5, 6, 7). Both subsets have to go through a process of maturation to be efficient stimulators of an adaptive immune response. Maturation can be triggered by different microbial stimuli interacting with TLRs. Expression of TLRs by different DC subsets is heterogeneous (8). In humans, TLR4 is only expressed by the cDCs in contrast to TLR9 that is only found on PDCs (9, 10, 11). In the mouse, these receptors are expressed by both subsets, with cDCs expressing a higher level of TLR4 than PDCs and PDCs expressing a higher level of TLR9 than cDCs (12, 13, 14, 15). Thus, in mice, PDCs and cDCs should be induced to mature using a single TLR agonist. The low frequency of some DC subsets has hampered their functional studies. Recently, a Flt3 ligand (FL)-dependent in vitro system has been established, which allows the generation of large numbers of PDCs and cDCs from bone marrow (BM) precursors (12, 16). This system has allowed a detailed in vitro characterization of both DC subsets with respect to their phenotype, maturation potential, and T cell stimulatory capacity. However, their in vivo CD8 T cell stimulatory potential and their capacity to induce memory CD8 T cell differentiation has not been studied in detail. In particular, the role of PDCs in this process, in vivo, remains highly debatable. To date, most of the studies on murine PDC function have been performed in vitro, using either ex vivo-isolated PDCs or PDCs differentiated from BM precursors. As expected, immature PDCs display a poor T cell stimulatory potential, whereas virus- or CpG-matured PDCs gain a substantial capacity to stimulate the proliferation of allogeneic or naive transgenic T cells in vitro (12, 13, 15, 17, 18, 19, 20, 21). However, a recent report (22) describes the generation of regulatory CD4 T cells following stimulation with CpG-matured PDCs, suggesting a role for mature PDCs in the establishment of immunological tolerance. The T cell stimulatory potential of PDCs in vivo remains less clear. Krug et al. (23) recently demonstrated that after in vivo viral stimulation PDCs failed to stimulate strong proliferation of naive T cells while being able to stimulate Ag-primed T cells in vivo. Salio et al. (24) reported that CpG-matured PDCs can prime only CD8 T cells specific for endogenous but not exogenous Ags in vivo. We have studied the capacity of in vitro FL-generated BM-derived DC (BMDC) subsets pulsed with a peptide to induce the differentiation of effector and memory CD8 T cells in vivo. DCs were matured using either LPS or CpG that bind TLR4 or TLR9, respectively. We show that unsorted FL-differentiated DCs matured with CpG or LPS and pulsed with a peptide induce the development of a primary CD8 response and the differentiation of memory CD8 T cells in vivo. Although CpG induced the maturation of both DC subsets, the generation of memory cells was mainly due to the cDC subset. F5 TCR-transgenic mice are a gift from Dr. D. Kioussis (National Institute for Medical Research, London, U.K.). CD8 T cells from F5 mice express a TCR recognizing a 9-aa peptide (NP68) from influenza A virus nucleoprotein (aa 366–374, ASNENMDAM) in the context of H-2Db MHC class I molecule. C57BL/10 mice were purchased from Iffa Credo. All mice were bred at the institute’s animal facility (Plateau de Biologie Expérimentale de la Souris-Ecole Normale Supérieure de Lyon) under pathogen-free conditions. For all experiments, 6- to 8-wk-old mice were used. Lymph node and spleen cells from F5 TCR-transgenic mice were pooled and incubated at 3 × 107 cells/ml with 10 μM CFSE (Molecular Probes) at 37°C for 10 min. Cells were then washed once with ice-cold DMEM (Invitrogen Life Technologies) containing 6% FBS (Invitrogen Life Technologies), followed by two more washes in PBS (Invitrogen Life Technologies). Each C57BL/10-recipient mouse received a total of 3 × 106 CFSE-labeled CD8+ F5 TCR-transgenic T cells by i.v. injection. BM cells were flushed from the tibias and femurs of C57BL/10 mice with culture medium composed of RPMI 1640 medium (Invitrogen Life Technologies) supplemented with 10% heat-inactivated FBS (Invitrogen Life Technologies), 2 mM l-glutamine (Invitrogen Life Technologies), 50 μM 2-ME (Sigma-Aldrich), 10 mM HEPES buffer (pH 7.4) (Invitrogen Life Technologies), and 50 μg/ml gentamicin (Invitrogen Life Technologies). After one centrifugation, BM cells were resuspended in Tris-ammonium chloride for 2 min to lyse RBC. After one more centrifugation, BM cells were cultured for 9 days at 1 × 106 cells/ml in culture medium supplemented with 200 ng/ml recombinant human FL (provided by Amgen) in 6-well plates (Costar Corning). Cultures were incubated at 37°C in 7% CO2-humidified atmosphere. The surface phenotype of the DCs we generated was identical to the detailed phenotype described by others (12). Peptide pulse and activation of DCs were performed at day 8 of the culture by the addition of 1 μM NP68 peptide (Dr. D. Ficheux, Institut de Biologie et Chimie de Proteines, Lyon, France) and 250 ng/ml LPS from Salmonella minnesota (Sigma-Aldrich) or 2 μg/ml phosphorothioate-modified oligodeoxynucleotides containing CpG motifs 1826 (Eurogentec) for the last 17–20 h of the culture. Day 9 DCs were harvested from the plates by vigorous pipetting followed by washing each well twice with room temperature PBS without Ca2+ or Mg2+ (Invitrogen Life Technologies). Before staining, Ab Fc binding on DCs was blocked by incubating DCs at 4°C for 10 min with the FcR-specific Ab 2.4 G2 prepared in house. For sorting experiments, cells were incubated for 20 min at 4°C with anti-CD11c biotin (clone HL3), anti-CD11b FITC (M170), and anti-B220 PE (RA3-6B2). A second incubation with streptavidin-CyChrome was performed to reveal CD11c+ cells. DCs were sorted into CD11c+CD11b−B220+ and CD11c+CD11b+B220− subsets (purity > 96%) using a FACSVantage cell sorter (BD Biosciences). For surface phenotyping, cells were incubated in FACS buffer (PBS, 1% FBS, and 0.1% azide) for 20 min at 4°C with anti-CD11c biotin and anti-B220 PE in combination with anti-IA/IE FITC (2G9), anti-H2Db FITC (Caltag Laboratories), anti-CD80 FITC (16-10A1), anti-CD86 FITC (GL1), or anti-CD40 FITC (3/23). To reveal bound anti-CD11c-biotinylated Abs, cells were washed and incubated with streptavidin-CyChrome. All Abs and streptavidin-CyChrome were purchased from BD Pharmingen, unless otherwise stated. Twenty-four hours after the transfer of CFSE-labeled F5 CD8 T cells, DC immunizations of C57BL/10 mice were performed by i.p. injection. Each mouse received 1 × 106 sorted peptide-charged DCs from each type CD11c+CD11b−B220+ (PDCs) or CD11c+CD11b+B220− (cDCs), respectively. When nonsorted DCs were used, each mouse received 2 × 106 DCs by i.p. injection. Spleen and lymph node cells (pool of mesenteric, inguinal, axillar, and brachial lymph nodes) from C57BL/10 recipient mice were collected at different times after immunization and stained with anti-CD8 CyChrome (clone 53-6.7) in combination with anti-CD44 PE (IM7), anti-CD122 PE (TM-β1), anti-Ly6C biotin (AL-21), or anti-CD62L biotin (MEL-14) at 4°C for 20 min in FACS stain buffer. To reveal bound anti-Ly6C- and anti-CD62L-biotinylated Abs, cells were washed and incubated with streptavidin-PE (Caltag Laboratories) at 4°C for 20 min. For intracellular cytokine staining, 5 × 106 lymph node cells or spleen cells from C57BL/10-recipient mice were incubated in 96-well plates with 0.67 μl/ml GolgiStop (BD Pharmingen) in the presence or absence of 10 nM NP68 peptide for 6 h. At the end of the incubation period, surface staining with CD8-CyChrome was performed for 20 min at 4°C. After one wash in FACS stain buffer, cells were permeabilized for 20 min in Cytofix-Cytoperm solution (BD Pharmingen) and washed with PermWash buffer (BD Pharmingen). Anti-IFN-γ Ab (clone XMG 1.2) was added to permeabilized cells for 30 min at 4°C. After one more wash in PermWash buffer, cells were resuspended in buffer for flow cytometric analysis. Cells were analyzed on a FACSCalibur flow cytometer (BD Biosciences). All Abs were purchased from BD Pharmingen. Memory CD8 T cells have been detected with the aid of NP68-H-2Db multimers purchased from ProImmune Limited. The tetramer staining was performed for 1 h at 4°C in FACS stain buffer. The number of F5 CD8 T cells was calculated using the percentage of CFSE+ F5 CD8 T cells (primary response) or tetramer-positive F5 CD8 T cells (memory phase) and the total cell number found in the lymph nodes or spleens of the mice using the following formula (total number of viable cells × percentage of CFSE- or tetramer-positive F5 CD8 T cells). This assay was performed as described previously (25). Briefly, targets were prepared from C57BL/10 splenocytes. Splenocyte suspension was divided into two populations. One population was pulsed with 1 μM NP68 peptide for 90 min at 37°C, washed extensively, and labeled with a high CFSE concentration (10 μM). The control population was incubated without peptide for 90 min at 37°C, washed, and labeled with a low CFSE concentration (1 μM). Cells were resuspended at 1 × 108/ml, and equal volumes of peptide-pulsed CFSEhigh and CFSElow cells were mixed together. A total of 2 × 107 CFSE-labeled cells was injected i.v. into C57BL/10 mice previously transferred with F5 cells and immunized with peptide-pulsed sorted or nonsorted DCs. After 12 h, mice were killed, and spleens and lymph nodes were analyzed by flow cytometry for the proportion of CFSE-labeled target cells. The two target populations were distinguished by their different CFSE fluorescence levels. Two parameters were used to evaluate the in vivo cytotoxic activity of CD8 T cells. The ratio between peptide-pulsed targets and control targets (ratio = percentage of CFSEhigh:percentage of CFSElow) and the percentage of specific lysis that normalized the cytolytic activity between immunized and nonimmunized mice. The specific lysis was calculated by the following formula: percentage of specific lysis = (1 − ratio immunized:ratio nonimmunized) × 100. We used a two-tailed unpaired t test to analyze the significance of the differences described in the different experimental conditions as indicated in the figures. Based on the expression of B220 and CD11b, FL-generated DCs can be divided into two subsets (12). The CD11c+B220+ have a surface phenotype similar to PDCs, and the CD11c+B220− are similar to cDCs (12, 18). To monitor the maturation of these cells following overnight incubation with LPS or CpG, we have measured the expression of different costimulatory molecules on their surface. Without activation, PDCs showed an immature phenotype with low levels of MHC class II and costimulatory molecules (CD80, CD86, and CD40) expression, whereas cDCs showed a more mature phenotype based on the expression level (mean fluorescence intensity (MFI)) of the same markers (Fig. 1⇓A). LPS or CpG treatments did not affect the expression of CD11c, CD11b, or B220 by the BMDCs (data not shown). As expected, LPS activated predominantly cDCs, all markers being up-regulated significantly, while it had little effect on the phenotype of PDCs. Indeed, PDCs from FL-generated BMDCs that matured in these conditions did mainly up-regulate CD80 and CD86 (4- to 6-fold MFI increase), with class II and CD40 being only weakly up-regulated (2-fold MFI increase; Fig. 1⇓B). In contrast, CpG treatment led to the activation of both DC subsets (Fig. 1⇓A). Although the level of costimulatory molecules reached following maturation with CpG was always higher on cDCs, there was a significant increase of all markers at the surface of PDCs as reflected by the MFI fold increase (Fig. 1⇓B). Based on costimulatory molecule expression levels, LPS induced a stronger maturation of cDCs than CpG (Fig. 1⇓B). In conclusion, CpG induces the maturation of both DC subsets, whereas LPS has a stronger maturation effect on cDCs than on PDCs. PDCs and cDCs show different expression of costimulatory molecules on their surface. BM cells were cultured for 8 days in the presence of human FL. After addition of CpG or LPS, the phenotype was determined by triple staining with anti-CD11c and anti-B220 and a panel of Abs to costimulatory molecules. A, The phenotype of CD11c+-gated cells is shown. Expression of different costimulatory molecules as well MHC class I and II on the surface of CD11c+B220+/PDCs and CD11c+B220−/cDCs is shown without activation or after overnight activation with CpG1826 or LPS. B, Fold increase of the costimulatory molecule MFIs after CpG or LPS activation as compared with nonstimulated cells. One of four experiments with similar results is shown. In a first series of experiments, we have investigated the capacity of total FL-differentiated DCs to induce CD8 T cell activation and effector differentiation in vivo. For this purpose, we have used an adoptive transfer system where CD8 F5 TCR-transgenic cells (specific for the NP68 peptide) are grafted into normal syngeneic C57BL/10 mice. DCs pulsed with NP68 peptide were then used to prime F5 CD8 T cells in vivo. CFSE labeling of F5 cells was used to monitor the surface phenotype and proliferation of these cells. After one immunization with mature DCs, a substantial fraction (>50%) of the transferred F5 CD8 T cells proliferated (Fig. 2⇓, A and B). CD8 T cells performed the same number of divisions after immunization, irrespective of the nature of the maturing agent (CpG or LPS) (Fig. 2⇓A). No proliferation was detected in the absence of DC immunization (Fig. 2⇓A). Interestingly, nonmatured DCs, i.e., DCs that had not been stimulated with a TLR agonist in vitro, always induced a low level of CD8 T cell proliferation (Fig. 2⇓, A and B). However, the number of CD8 T cells having performed at least one division was always greater with matured DCs. LPS-matured DCs were always more potent than CpG-matured ones (Fig. 2⇓B). Thus, immunization with mature FL-generated DCs induced a significant CD8 T cell proliferation in vivo. 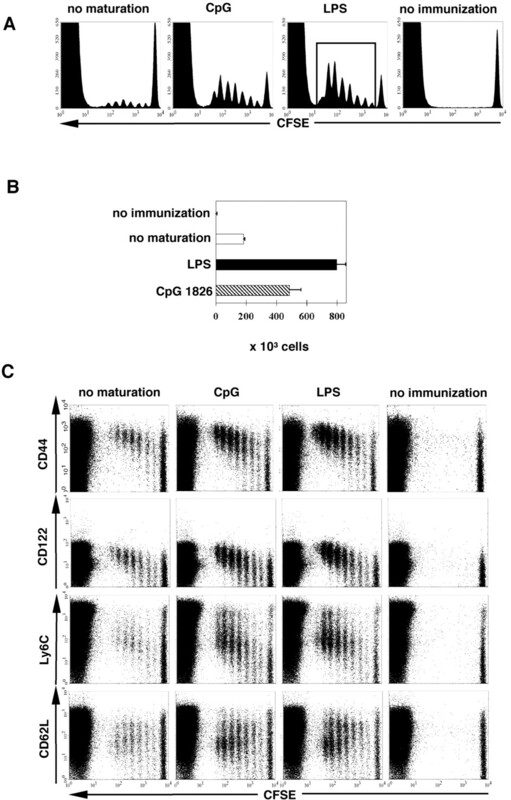 Immunization with FL-generated DCs induces CD8 T cell proliferation in vivo. F5-transferred C57BL/10 mice were injected i.p. with LPS- or CpG-matured NP68-pulsed DCs. CFSE profiles and surface markers were analyzed 72 h later in the lymph nodes (similar results were obtained in the spleens). A, CFSE profile of F5 CD8 T cells 72 h after DC immunization is shown. One of three experiments with similar results is shown. B, The number of F5 CD8 T cells that have performed at least one division was calculated using the gate depicted in A. Values are the means of three independent experiments. C, Surface expression of CD44, CD122, Ly6C, and CD62L on CD8+ cells from the lymph nodes of transferred C57BL/10 recipients is shown. One of three experiments with similar results is shown. We also monitored the expression of activation markers on the surface of CD8 T cells in parallel to their division profile. 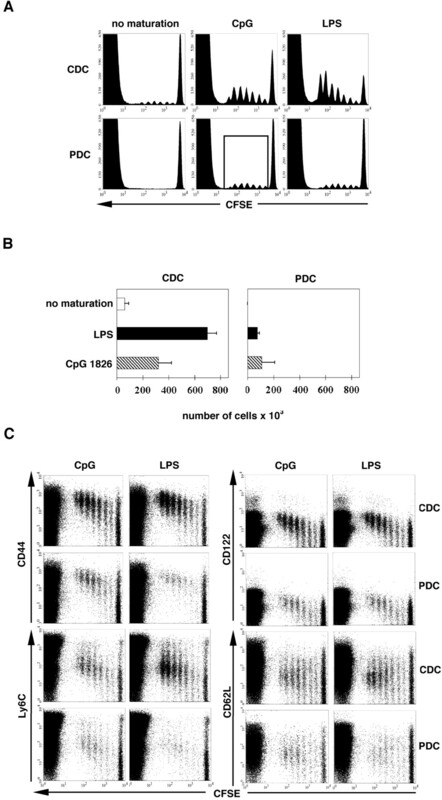 CD8 T cells activated with CpG- or LPS-matured DCs showed a cell division-associated up-regulation of CD44 and Ly6C and became CD122+, whereas CD62L was partially down-regulated (Fig. 2⇑C). The small fraction of CD8 T cells activated by nonmatured DCs showed the same pattern of surface marker changes as CD8 T cells activated with mature DCs (Fig. 2⇑C). The capacity of FL-generated DCs to induce IFN-γ production and cytotoxic function of transferred CD8 T cells was also measured. A small fraction of IFN-γ producing CD8 T cells was generated in mice injected with nonmatured DCs (Fig. 3⇓, A and B), suggesting that some spontaneously matured DCs are able to induce the differentiation of naive CD8 T cells into IFN-γ producers. However, LPS- or CpG-matured DCs were able to induce the differentiation of greater numbers of IFN-γ-producing effector cells (Fig. 3⇓A). The frequency of IFN-γ-producing CD8 T cells was not significantly different following immunization with LPS- or CpG-matured DCs (p = 0.33) (Fig. 3⇓B). DC priming induces IFN-γ production and CTL differentiation in vivo. A, F5 CD8 T cells labeled with CFSE were transferred into C57BL/10 mice, and 24 h later, mice were injected i.p. with LPS- or CpG-matured NP68-pulsed DCs. Lymph node cells were analyzed 72 h later (similar results were obtained in the spleens). To reveal IFN-γ production, cells were restimulated in vitro with NP68 peptide for 6 h, and the cytokine was detected as described in Materials and Methods. B, The frequency of IFN-γ-positive cells among transferred F5 CD8 T cells was calculated by gating on the CD8+/CFSE+ cells as shown in A. Values are the means of three experiments. Two-tailed unpaired t test was used to compare the values for IFN-γ production induced by LPS- or CpG-matured DCs (p = 0.33). C, CTL function was assayed in vivo 72 h after DC immunization by the transfer of CFSE-stained peptide-pulsed splenocyte target cells from C57BL/10 mice. The specific lysis was calculated as explained in Materials and Methods. Numbers indicate the percentage of specific lysis in the lymph nodes. One of three representative experiments is shown. D, Specific lysis in the lymph nodes of recipient mice. Results are the means of three experiments. The cytotoxic capacity of CD8 T cells was assayed in vivo against syngeneic peptide-pulsed C57BL/10 splenocyte targets as explained in Materials and Methods. CD8 T cells primed with mature DCs efficiently lysed peptide-pulsed syngeneic splenocytes (Fig. 3⇑C). Nonmatured DCs were able to induce some CD8-cytotoxic function, whereas no significant level of cytotoxicity was detected in nonimmunized mice (Fig. 3⇑, C and D). Collectively, these data demonstrate that mature FL-generated DCs are able to induce proliferation and effector function development of Ag-specific naive CD8 T cells in vivo. The capacity to prime Ag-specific CD8 T cells in vivo was then studied for each DC subset. To do this, we have sorted PDCs and cDCs on the basis of their phenotype as explained in Materials and Methods. C57BL/10 mice transferred with CFSE-labeled F5 CD8 T cells were injected with an equal number of sorted PDC or cDC cells. The proliferation and the effector functions developed by the T cells following DC priming was then measured in vivo. Three days after priming, the number of divisions performed by activated CD8 T cells was identical whether they had been primed with one or the other DC subset (Fig. 4⇓A). However, the number of CD8 T cells having proliferated following immunization with mature PDCs was much lower than following immunization with mature cDCs (Fig. 4⇓B). This was true whether FL-generated DCs were matured with LPS or CpG. cDCs activated with LPS showed more potent stimulatory capacity than when activated with CpG (Fig. 4⇓B). Nonmatured cDCs elicited minimal proliferation of CD8 T cells, whereas nonmatured PDCs never induced any detectable CD8 T cell proliferation (Fig. 4⇓, A and B). These results suggest that the capacity of unsorted FL-generated DCs to induce CD8 proliferation in vivo is mainly due to the cDC subset. PDCs and cDCs induce quantitatively different proliferative CD8 T cell response in vivo. F5-transferred C57BL/10 mice were injected i.p. with peptide-pulsed sorted PDCs or cDCs that had been matured either with LPS or CpG. Nonmatured peptide-pulsed PDCs or cDCs were used as controls. A, CFSE profiles of cDC- and PDC-activated CD8 T cells. No CD8 proliferation was detected in the nonimmunized mice (data not shown). B, Number of F5 CD8 T cells recruited into division was calculated using the gate depicted in A. Values are means of three independent experiments. C, Surface expression of CD44, CD122, Ly6C, and CD62L on CD8+ cells from the lymph nodes of transferred C57BL/10 recipients is shown. One of three experiments with similar results is shown. We also measured the expression of activation markers on the surface of CD8 T cells following immunization with cDCs or PDCs. The levels of the surface markers expressed by CD8 T cells that have entered proliferation were similar following all immunization conditions tested, suggesting that the maturation conditions of DCs or the subset do not influence the expression of these markers by CD8 T cells in vivo (Fig. 4⇑C). The capacity of each DC subset to induce the production of IFN-γ by CD8 T cells that had divided was then tested. 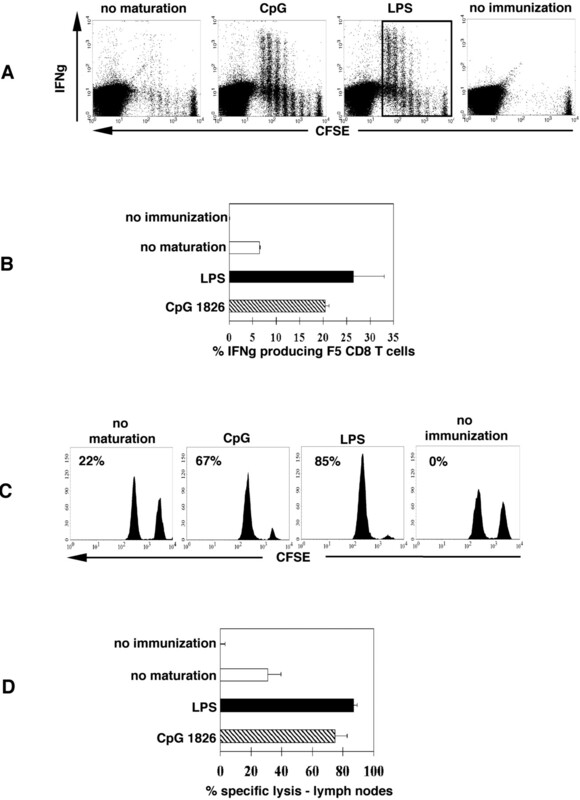 cDCs matured with LPS or CpG induced a similar proportion of IFN-γ-producing CD8 T cells (Fig. 5⇓). When DCs were matured with CpG, the proportion of IFN-γ-producing CD8 T cells among the cells that had entered cell division was similar for both subsets of DCs (Fig. 5⇓). These results suggest that PDCs and cDCs matured with CpG have the capacity to induce the differentiation of CD8 T cells into IFN-γ-producing effectors. However, as the number of CD8 T cells that had divided in response to PDCs was low, the IFN-γ response induced by PDCs was weak compared with the one induced by cDCs. Furthermore, following LPS maturation, the proportion of cells producing IFN-γ was much lower when PDCs were used for priming when compared with cDCs. This proportion was similar to the one obtained using nonmatured cDCs. In conclusion, overall, cDCs were more potent inducers of IFN-γ than PDCs because of the higher number of CD8 T cells that have proliferated. CD8 T cells IFN-γ production capacity following priming with PDCs or cDCs in vivo. F5-transferred C57BL/10 mice were injected i.p. with LPS- or CpG-matured peptide-pulsed PDCs or cDCs. Seventy-two h later, lymph node cells were analyzed for IFN-γ production as described in Materials and Methods. The frequency of IFN-γ-positive cells among F5 CD8 T cells that have divided was calculated by gating on the CD8+/CFSE+ cells as shown in Fig. 4⇑A. All the values shown are the means of six mice in two experiments. We next tested the capacity of total FL-differentiated DCs and sorted DC subsets to induce the differentiation of memory CD8 T cells in vivo. Because CpG was able to induce the maturation of both DC subsets, it was used in these experiments to induce the maturation of total FL-differentiated DCs. We first measured the survival of F5 CD8 T cells 60 days after immunization with total FL-generated DCs. Tetramer and IFN-γ staining were performed on the spleen and lymph node cell suspensions from CD8-transferred C57BL/10-recipient mice. As indicated on Fig. 6⇓A, the frequency of tetramer-positive cells was four times higher in DC-immunized mice when compared with nonimmunized controls. In DC-immunized mice, a significant proportion (∼80%) of tetramer-binding cells was also able to produce IFN-γ after a brief in vitro restimulation with NP68 peptide, whereas a very low frequency of IFN-γ-producing cells was detected among CD8 T cells from nonimmunized mice (Fig. 6⇓, A and B). In addition to their capacity to produce IFN-γ, CD8 T cells from DC-injected mice showed a typical memory phenotype as compared with nonimmunized controls (Fig. 6⇓C). Thus, one immunization with CpG-matured FL-generated DCs was sufficient to induce the differentiation of memory CD8 T cells in vivo. Immunization with mature FL-derived DCs induces memory CD8 T cell differentiation in vivo. F5-transferred C57BL/10 mice were injected ip. with CpG-matured NP68-pulsed DCs. Sixty days later, lymph node cells were stained with NP68/tetramers and anti-CD44, CD122, Ly6C, and CD62L. To reveal IFN-γ production, cells were restimulated in vitro with NP68 peptide for 6 h, and the cytokine was detected as described in Materials and Methods. A, Numbers indicate the frequency of tetramer-positive and IFN-γ-producing CD8 T cells among the lymph node cells of immunized and nonimmunized C57BL/10 mice (similar results were obtained in the spleens). One of three representative experiments is shown. B, Numbers of tetramer-positive and IFN-γ-producing CD8 T cells in the lymph nodes of immunized and nonimmunized C57BL/10 mice. Values are the means from six mice in three independent experiments. C, Phenotype of tetramer-positive CD8 T cells in the lymph nodes of immunized and nonimmunized C57BL/10 mice. One of three representative experiments is shown. The capacity of CpG-matured cDCs and PDCs to induce the differentiation of memory CD8 T cells in vivo 60 days after priming was next tested. Immunization with CpG-matured cDCs induced a 4-fold increase in the number of tetramer-positive cells compared with the nonimmunized control (Fig. 7⇓, A and B). Most of these cells produced IFN-γ and showed a typical memory phenotype (Fig. 7⇓A and data not shown). 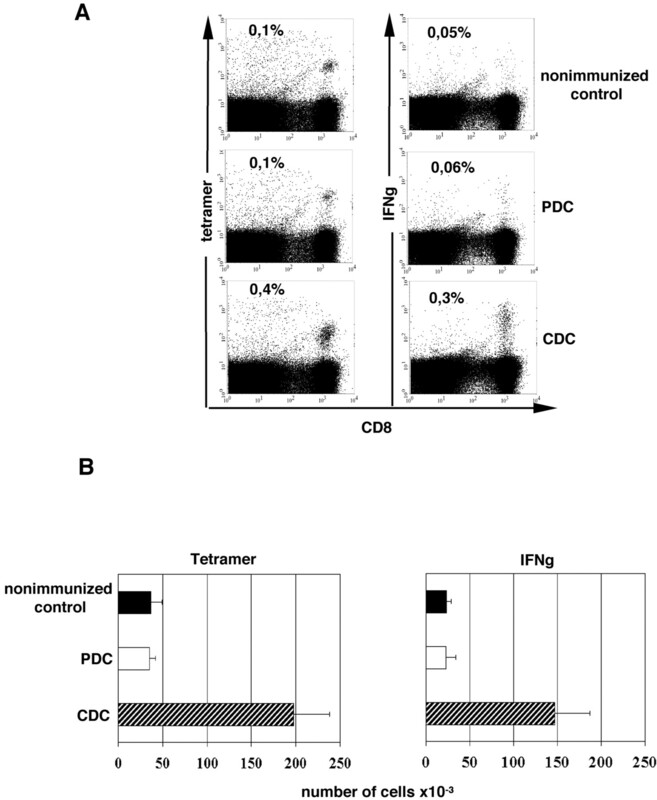 The same number of tetramer-positive cells was found in PDC-immunized and in nonimmunized mice (Fig. 7⇓, A and B). In addition, these cells did not produce IFN-γ when restimulated with a peptide in vitro and conserved their naive phenotype (Fig. 7⇓A and data not shown). In conclusion, in vivo, memory CD8 T cell differentiation is mainly driven by cDCs but not PDCs. cDCs but not PDCs induce differentiation of memory CD8 T cells in vivo. F5-transferred C57BL/10 mice were injected i.p. with CpG-matured NP68-pulsed PDCs or cDCs. Sixty days later, lymph node cells were stained with NP68/tetramers and anti-CD8. To reveal IFN-γ production, cells were restimulated in vitro with the NP68 peptide for 6 h, and the cytokine was detected as described in Materials and Methods. A, Numbers indicate the frequency of tetramer positive and IFN-γ producing CD8 T cells among the lymph node cells of immunized and nonimmunized C57BL/10 mice. One of six mice is shown. B, Numbers of tetramer-positive and IFN-γ-producing CD8 T cells in the lymph nodes of immunized and nonimmunized C57BL/10 mice. Values are the means of six mice from two independent experiments. In this article, we show that FL-generated, matured, and peptide-pulsed murine DCs are able to efficiently prime naive CD8 T cells and to induce memory CD8 T cell differentiation in vivo. We also demonstrated that only mature cDCs but not mature PDCs were able to efficiently prime naive peptide-specific CD8 T cells in vivo and to induce the differentiation of memory CD8 T cells. Thus, among FL-generated DCs, cDCs are the main subset able to activate peptide-specific CD8 T cells and to induce the development of an efficient protective immunity through the generation of memory cells. In our system, mature PDCs were inefficient in stimulating the proliferation and effector functions of Ag-specific CD8 T cells in vivo when compared with cDCs. Although, PDCs were able to up-regulate significantly most of the costimulatory molecules in response to CpG oligodeoxynucleotides, the level of expression of these molecules remained always lower when compared with that of cDCs. Thus, at least in part, the lower stimulatory capacity of PDCs could be due to the lower level of costimulatory molecules that are expressed on their surface. We found that more CD8 T cells were able to enter into proliferation when activated with mature cDCs than with PDCs. However, the number of divisions as well as the pattern of activation markers expressed by CD8 T cells was identical, following stimulation with PDCs or cDCs. Moreover, we found a similar proportion of IFN-γ-producing cells among the CD8 T cells that had entered division when these cells were stimulated with CpG-matured cDCs or PDCs. Thus, in our system, PDCs and cDCs showed a quantitative but not qualitative difference in their potential to prime CD8 proliferation and cytokine production, suggesting that other factors could be responsible for the low frequency of cells that are activated by PDCs. The weak CD8 stimulation observed with mature PDCs could result from regulatory T cell-mediated inhibition. It was reported that immature PDCs can induce the differentiation of regulatory CD8 or CD4 T cells with suppressor function (17, 22, 26, 27, 28, 29). However, in our experimental setting, this seems unlikely because cDCs demonstrated an equal CD8 T cell stimulatory capacity whether injected alone or in combination with PDCs. In our experiments, cDCs matured with LPS showed a better stimulatory capacity than when matured with CpG. These data correlated well with the reported TLR expression pattern of these cells (12, 15). The maturation of cDCs by CpG could be explained by the direct stimulation of cDCs by CpG (a low level of TLR9 expression by murine cDCs was reported (12)) or alternatively by the existence of a “cross-talk” between activated PDCs and cDCs in vitro (15). Indeed, PDCs following CpG maturation produce type I IFN that could participate in the activation of cDCs. The contribution of PDCs in the process of cDC activation could be evaluated by maturating cDCs in the absence of PDCs. However, cDCs already show a partially mature phenotype in the experimental conditions we have used (i.e., 8 days of differentiation, followed by overnight peptide pulsing without changing the culture well, followed by FACS sorting). We have observed that this maturation is further increased if cells are first purified, then replated for maturation, making it difficult to assess the contribution to maturation of different TLR agonists. The cross-talk between different DC subsets following TLR-induced maturation could be tested using in vivo FL-generated DCs. These cells can be generated in large numbers and have an immature phenotype. We are currently comparing the phenotype of the DC subsets generated with FL in vitro vs in vivo. One important difference that we found between PDCs and cDCs is their capacity to induce peptide-specific memory CD8 T cell differentiation in vivo. In our immunization conditions, we were not able to detect peptide-specific CD8 T cells with memory phenotype after peptide-pulsed PDC injection. This could result either from the low primary expansion induced by PDCs (30) or alternatively by the lack of some costimulatory signals that would be important for the differentiation into memory cells but not into effector cells. In a recent work, Schlecht et al. (31) underscored the importance of the maturation signals for CD8 T cell stimulatory capacity of PDCs. Thus, peptide-pulsed PDCs matured in vivo with CpG were not able to induce efficient CD8 T cell responses nor memory differentiation, which is in agreement with our results. However, influenza virus-activated PDCs induced an efficient primary response and memory CD8 T cell development in vivo. The importance of the maturation status of DCs for the induction of an immune response was underscored in a recent report (32) describing the use of FL for a therapeutic treatment of cancer patients. FL injections led to an increase in the number of circulating DCs (32). However, these DCs were partially activated and failed to induce an immune response in cancer patients. Thus, additional factors are needed to induce DCs that can efficiently stimulate the immune system. In this context, ex vivo isolation and appropriate maturation and peptide pulsing of FL-generated DCs could serve as a powerful tool for DC-based immunotherapy of cancer patients. In our experiments, we found that the CD8 T cell stimulatory capacity of peptide-pulsed FL-generated DCs is mainly associated with the cDC subset. We also show that PDCs are neither good stimulators nor inhibitors of this response. Thus, a protective CD8 T cell immunity against a given antigenic peptide could be attained using separated cDC or total DC cultures, pulsed with a peptide, and matured with appropriate TLR agonist(s). These data could be of use when designing efficient immunotherapy protocols. We thank L. Beloeil and T. De Smedt for helpful discussions, C. Arpin for critical reading of this manuscript, and C. Bella and the staff of the Plateau de Biologie Expérimentale de la Souris for their technical assistance. ↵1 This work was supported by institutional grants from Institut National de la Santé et de la Recherche Médicale, Association pour la Recherche contre le Cancer, Ligue régionale de lutte contre le cancer, Région Rhône-Alpes Grant 00816045, Université Claude Bernard Lyon-I, and Cancéropole nationale. G.S.A. is supported by a grant from the Association pour la Recherche contre le Cancer. ↵3 Abbreviations used in this paper: DC, dendritic cell, PDC, plasmacytoid DC; cDC, conventional DC, FL, Flt3 ligand; BM, bone marrow; BMDC, BM-derived DC; MFI, mean fluorescence intensity. Ardavin, C.. 2003. Origin, precursors and differentiation of mouse dendritic cells. Nat. Rev. Immunol. 3: 582-590. Grouard, G., M. C. Rissoan, L. Filgueira, I. Durand, J. Banchereau, Y. J. Liu. 1997. The enigmatic plasmacytoid T cells develop into dendritic cells with interleukin (IL)-3 and CD40-ligand. J. Exp. Med. 185: 1101-1111. Siegal, F. P., N. Kadowaki, M. Shodell, P. A. Fitzgerald-Bocarsly, K. Shah, S. Ho, S. Antonenko, Y.-J. Liu. 1999. The nature of the principal type 1: interferon-producing cells in human blood. Science 284: 1835-1837. Nakano, H., M. Yanagita, M. D. Gunn. 2001. CD11c+B220+Gr-1+ cells in mouse lymph nodes and spleen display characteristics of plasmacytoid dendritic cells. J. Exp. Med. 194: 1171-1178. Bjorck, P.. 2001. Isolation and characterization of plasmacytoid dendritic cells from Flt3 ligand and granulocyte-macrophage colony-stimulating factor-treated mice. Blood 98: 3520-3526. Asselin-Paturel, C., A. Boonstra, M. Dalod, I. Durand, N. Yessaad, C. Dezutter-Dambuyant, A. Vicari, A. O’Garra, C. Biron, F. Briere, G. Trinchieri. 2001. Mouse type I IFN-producing cells are immature APCs with plasmacytoid morphology. Nat. Immunol. 2: 1144-1150. Ito, T., R. Amakawa, S. Fukuhara. 2002. Roles of Toll-like receptors in natural interferon-producing cells as sensors in immune surveillance. Hum. Immunol. 63: 1120-1125. Brawand, P., D. R. Fitzpatrick, B. W. Greenfield, K. Brasel, C. R. Maliszewski, T. De Smedt. 2002. Murine plasmacytoid pre-dendritic cells generated from Flt3 ligand-supplemented bone marrow cultures are immature APCs. J. Immunol. 169: 6711-6719. Boonstra, A., C. Asselin-Paturel, M. Gilliet, C. Crain, G. Trinchieri, Y.-J. Liu, A. O’Garra. 2003. Flexibility of mouse classical and plasmacytoid-derived dendritic cells in directing T helper type 1 and 2 cell development: dependency on antigen dose and differential Toll-like receptor ligation. J. Exp. Med. 197: 101-109. Reis e Sousa, C.. 2004. Toll-like receptors and dendritic cells: for whom the bug tolls. Semin. Immunol. 16: 27-34. Krug, A., A. Towarowski, S. Britsch, S. Rothenfusser, V. Hornung, R. Bals, T. Giese, H. Engelmann, S. Endres, A. M. Krieg, G. Hartmann. 2001. Toll-like receptor expression reveals CpG DNA as a unique microbial stimulus for plasmacytoid dendritic cells which synergizes with CD40 ligand to induce high amounts of IL-12. Eur. J. Immunol. 31: 3026-3037. Brasel, K., T. De Smedt, J. L. Smith, C. R. Maliszewski. 2000. Generation of murine dendritic cells from flt3-ligand-supplemented bone marrow cultures. Blood 96: 3029-3039. Martin, P., G. M. del Hoyo, F. Anjuere, C. F. Arias, H. H. Vargas, L. A. Fernandez, V. Parrillas, C. Ardavin. 2002. Characterization of a new subpopulation of mouse CD8α+B220+ dendritic cells endowed with type 1 interferon production capacity and tolerogenic potential. Blood 100: 383-390. O’Keeffe, M., H. Hochrein, D. Vremec, I. Caminschi, J. L. Miller, E. M. Anders, L. Wu, M. H. Lahoud, S. Henri, B. Scott, et al 2002. Mouse plasmacytoid cells: long-lived cells, heterogeneous in surface phenotype and function, that differentiate into CD8+ dendritic cells only after microbial stimulus. J. Exp. Med. 196: 1307-1319. O’Keeffe, M., H. Hochrein, D. Vremec, B. Scott, P. Hertzog, L. Tatarczuch, K. Shortman. 2003. Dendritic cell precursor populations of mouse blood: identification of the murine homologues of human blood plasmacytoid pre-DC2 and CD11c+ DC1 precursors. [Published erratum appears in 2003 Blood 101: 3364.]. Blood 101: 1453-1459. Gilliet, M., A. Boonstra, C. Paturel, S. Antonenko, X.-L. Xu, G. Trinchieri, A. O’Garra, Y.-J. Liu. 2002. The development of murine plasmacytoid dendritic cell precursors is differentially regulated by FLT3-ligand and granulocyte/macrophage colony-stimulating factor. J. Exp. Med. 195: 953-958. Moseman, E. A., X. Liang, A. J. Dawson, A. Panoskaltsis-Mortari, A. M. Krieg, Y.-J. Liu, B. R. Blazar, W. Chen. 2004. Human plasmacytoid dendritic cells activated by CpG oligodeoxynucleotides induce the generation of CD4+CD25+ regulatory T cells. J. Immunol. 173: 4433-4442. Krug, A., R. Veeraswamy, A. Pekosz, O. Kanagawa, E. R. Unanue, M. Colonna, M. Cella. 2003. Interferon-producing cells fail to induce proliferation of naive T cells but can promote expansion and T helper 1 differentiation of antigen-experienced unpolarized T cells. J. Exp. Med. 197: 899-906. Salio, M., M. J. Palmowski, A. Atzberger, I. F. Hermans, V. Cerundolo. 2004. 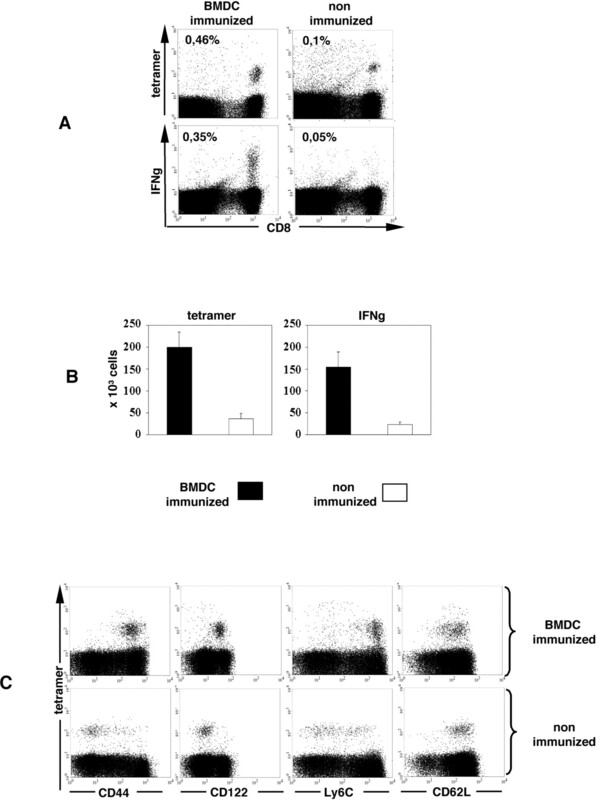 CpG-matured murine plasmacytoid dendritic cells are capable of in vivo priming of functional CD8 T cell responses to endogenous but not exogenous antigens. J. Exp. Med. 199: 567-579. Quemeneur, L., L. Beloeil, M.-C. Michallet, G. Angelov, M. Tomkowiak, J.-P. Revillard, J. Marvel. 2004. Restriction of de novo nucleotide biosynthesis interferes with clonal expansion and differentiation into effector and memory CD8 T cells. J. Immunol. 173: 4945-4952. Steinman, R. M., M. C. Nussenzweig. 2002. Inaugural Article: Avoiding horror autotoxicus: The importance of dendritic cells in peripheral T cell tolerance. Proc. Natl. Acad. Sci. USA 99: 351-358. Dhodapkar, M. V., R. M. Steinman. 2002. Antigen-bearing immature dendritic cells induce peptide-specific CD8+ regulatory T cells in vivo in humans. Blood 100: 174-177. Kuwana, M.. 2002. Induction of anergic and regulatory T cells by plasmacytoid dendritic cells and other dendritic cell subsets. Hum. Immunol. 63: 1156-1163. Schlecht, G., S. Garcia, N. Escriou, A. A. Freitas, C. Leclerc, G. Dadaglio. 2004. Murine plasmacytoid dendritic cells induce effector/memory CD8+ T-cell responses in vivo after viral stimulation. Blood 104: 1808-1815. Marroquin, C. E., J. A. Westwood, R. Lapointe, A. Mixon, J. R. Wunderlich, D. Caron, S. A. Rosenberg, P. Hwu. 2002. Mobilization of dendritic cell precursors in patients with cancer by flt3 ligand allows the generation of higher yields of cultured dendritic cells. J. Immunother. 25: 278-288.